I've started the project modeling a car with SolidWorks 2 weeks ago. I've decided to choose the Audi R8. Feel free to post any comments! Here we go with the blueprints! hey how long did this take you?? looks awesome! do mind sharing the file again? Here we go with the wheels! Good attempt at the old R8. I`ve been using solidworks for years now, and the sufacing has got better over those years, still long way to go before it reaches Alias. I would say one thing, and that is there are certain areas on the model of the bonet/front of the R8 model, that seem to have questionable surface detail. You might want to have a look in these areas (marked red on the image). 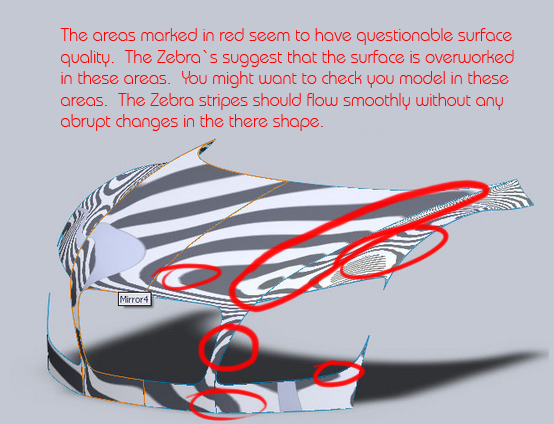 I've already corrected some of the surface details that you were talking about. I will post pictures soon! Thanks for the comment Dave. I've worked a little bit on the tire, I don't think it's necessary to go too fancy. I will add a decal on the wall when I will render it later. Wow, I'm loving seeing it step-by-step - can't wait to see it finished! Are you going to do much of the interior? The interior will be basic. I think I will model only the big parts: Seats, a simplified dashboard and the steering wheel. I can't wait to see it finished too!! Here we go again. I've found a way to add details to the wall of the tire. It's time for an update! I've been focusing on other things lately but I've decided to put some work on the Audi R8 today. I've done some work on the back of the car.